Honors: (1) All time Top-10 Highest Grossing Film in Japan. (2) Best Picture at the 21th Japan Academy Awards. Synopsis: As Japan enters Iron Age, conflicts arise between nature (represented by the forest gods and wolf girl San) and human development (represented by Lady Eboshi and her people). Neither is willing to yield to the other. Caught in between is young hero Ashitaka who want both nature and humanity to peacefully coexist. Unfortunately, a brutal war between the forest gods and the humans is inevitable. Can Ashitaka save the land from total destruction? Story: The plot of Princess Mononoke is similar to that of H. G. Wells' War of the Worlds. Instead of a war between the Martians and the humans, we have a clash between nature and humanity. This is indeed very Japanese. Japan is known both for its technological development and for its natural beauty. Scriptwriter Hayao Miyazaki did not pick a side in Mononoke like Al Gore and other environmentalists often do. Instead, he tried to humanize each side of the conflict and illustrate the consequences of humanity overstepping its bounds. Note how the ending is open-ended. It is up to San and Lady Eboshi to decide their own courses. This is the genius of Miyazaki's writing. Animation/Direction: I watched this movie many years ago and re-watched it again for this review. The movie is as visually stunning now as it was a decade ago. The film does show its age, but fifteen minutes into the movie you will probably forget this is an animated feature from 20 years ago. The visuals are beautiful; the characters are fluidly rendered; the direction is masterful. As I mentioned in my review of Kiki's Delivery Service, few directors can produce an animated film like Miyazaki can. Music: Incredible music is always a trademark of Studio Ghibli's movies and Mononoke is not an exception. Thanks to master composer Joe Hisaishi, this film features many of the most iconic music in Asian cinema. 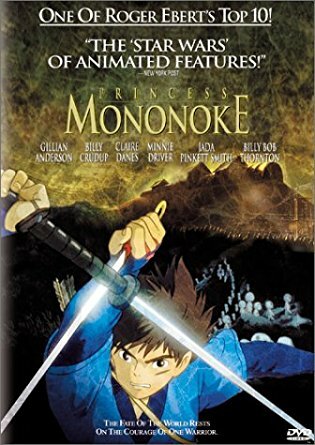 I have watched numerous Asian period movies and series (more than I really should) and a lot of music from Mononoke & their remixes are featured in these films. My Favorite Character: Yakul or Yakkuru. I can't find anyone who dislikes Ashitaka's lovable elk? Yakul is loyal, almost to a fault. Even when he is seriously injured, he is reluctant to leave his master's side. He is also a friendly elk, quickly striking a bond with San and the two wolves. In battle, he is gritty and brave carrying Ashitaka on his back through layers of enemies and over tough terrains. What more can we ask from an animal friend? Final Comment: Video developer Nintendo is prepping for the next Zelda's epic titled Breath of the Wild, due for release in 2017. From even the game's first trailer, fans around the world have noticed similarities between the world in Breath of the Wild and that of Mononoke. They are ecstatic at the possibility the game took inspirations from Miyazaki's epic. What could be better than a Link's adventure in a world as beautiful as Mononoke? While Nintendo has neither confirmed nor denied the possibility, this just demonstrates to us the influence Mononoke has not just on Japanese culture but on world culture as well. Note that I am not in any way affiliated with Nintendo.